CWDM, just as DWDM, use multiple light wavelengths to transmit signals over a single optical fiber. However, there are still some differences betwwen the two techologies in many ways. CWDM uses a 20-nm wavelength spacing that is much wider than the 0.4 nm for DWDM. The wider wavelength spacing in CWDM means lower product development costs. This is one reason why CWDM is less costly than DWDM. Most CWDM devices operate in the 1470-nm to 1610-nm range. The frequency grid for DWDM and the wavelength grid for CWDM systems are defined by the international telecommunication union (ITU) standard G.694.1 and G.694.2, respectively. CWDM provides a maximum of 8 lambadas between two CWDM multiplexers over a single fiber pair as compared to DWDM Multiplexers, which support up to 32 lambdas (based on 0.8-nm or 100-GHz wavelength spacing) over a single fiber pair. some long-haul DWDM systems can support up to 160 lambdas per fiber pair. Each CWDM channels uses a specialized gigabit interface converter (GBIC) or small form-factor pluggable (SFP) transceivers are commonly known as colored GBIC and SFP. Each CWDM channels uses a different “color” GBIC or SFP because each lambda represents a different color in the spectrum. In this case, the native GBIC or SFP in the client devices are substituted with a colored GBIC or SFP. CWDM multiplexers are usually passive (i.e, not powered) devices containing a very accurate prism to multiplex eight separate wavelengths of light along a single fiber pair. And passive CWDM devices cannot generate or repeat optical signals. No amplification is possible with CWDM because CWDM uses wavelengths that cannot be amplified with EDFA amplifiers. Therefore, the maximum distance for a CWDM link is approximately 100 km. The Cisco ONS 15501 EDFA, which has a wavelength range of 1530 nm to 1563 nm, can only amplify two signals (1530 nm and 1550 nm) out of the eight signals that are multiplexed onto the fiber pair. CWDM provides an alternative solution to DWDM for low-latency and high-bandwidth requirements associated with synchronous replication application. However, DWDM is more scalable than CWDM. 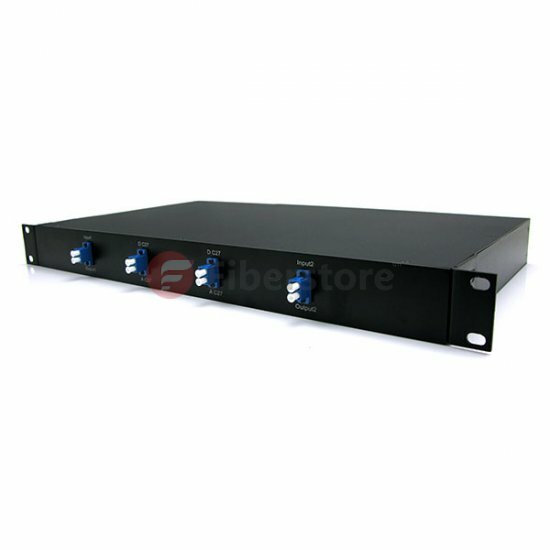 DWDM also has a longer distance capacity than CWDM because DWDM can be amplified. 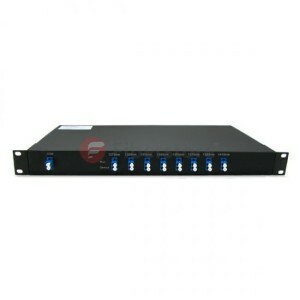 The main benefit of CWDM is its low cost. It is a cheaper solution than DWDM. In other words, CWDM is optimized for cost, while DWDM is optimized for bandwidth. For enterprises that have access to dark fiber and have only limited scalability requirement, CWDM is a relatively inexpensive way to achieve low-latency and high-bandwidth interconnections between DCs. The CWDM implementation also results in less complex installation, configuration, and operation as compared to DWDM. CWDM can be deployed in point-to-point, linear, or fiber protected ring topologies, It is limited to a distance of up to 120 km for Gigabit Ethernet and 100 km for 2-G FC in a point -to-point topology. It is typically used only for extension of the FC fabric in a metro or campus application. As CWDM carries only eight lambdas on a single fiber pair, there are limits to the number of possible drops and the number of sites that can be interconnected. A ring or linear topology reduces the distance depending on the number of OADMs traversed by the CWDM channels because each CWDM OADM introduces additional power loss in the network. CWDM can also be used to enable multiple ISL connections between the switches over a single fiber since it requires less fiber for interconnecting two metro sites. The same benefit applies to port channel implementation between the switches. In short, DWDM is a solution that provides a higher number of connections and longer reach, or extension, at a much higher cost while CWDM is a more cost-effective solution for metro or campus solutions where the distance is limited.